Chicken Gloria or Chicken a la Gloria is a comforting chicken and mushroom casserole. A super quick to prepare delicious and mouthwatering casserole dish perfect for a weeknight ready in 1 hour from start to finish. Chicken Gloria or Chicken a la Gloria is an old chicken casserole dish that many of us have grown up with. Not sure who Gloria is or where the origin of this dish comes from but it’s a favorite of mine. I love creamy, cheesy casseroles like this, that are easy to make. 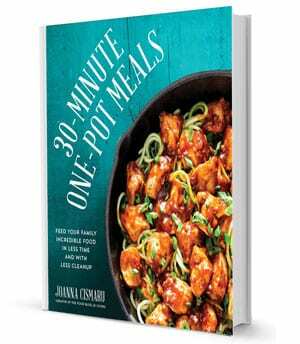 This recipe is a reader favorite on my blog. I’m talking tender chicken smothered in a creamy mushroom sauce then topped with cheese and baked to perfection. What’s not to love about this incredible dish? 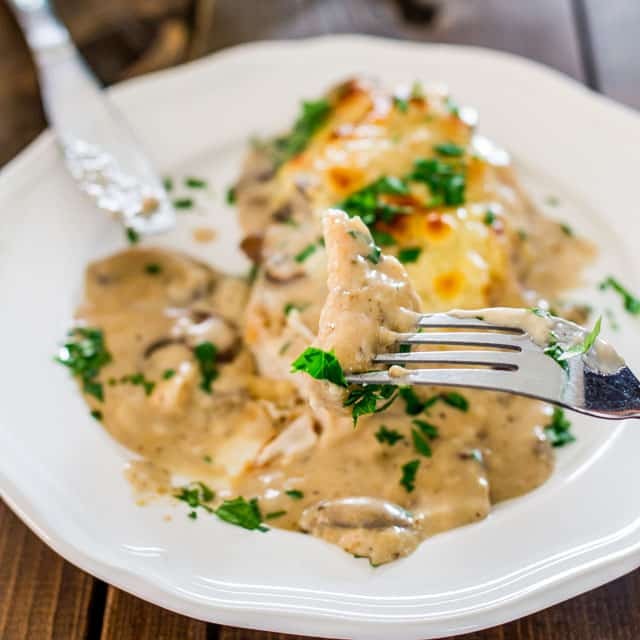 Chicken Gloria is a hearty chicken dish that has become so popular and a favorite because of how easy it is to prepare and simply for the fact that it’s creamy, cheesy and delicious! This chicken is incredibly tender, loaded with mushrooms and a true comforting dish! I love to use cremini mushrooms in this casserole but regular white mushrooms work just as well. This chicken and mushroom dish is so quick to make and it’s simply mouthwatering. Chicken and mushrooms for me is a great combination and I just love the idea of marrying the two and because you basically cook the chicken twice, once fried and once in the oven, it becomes super moist and delicious. 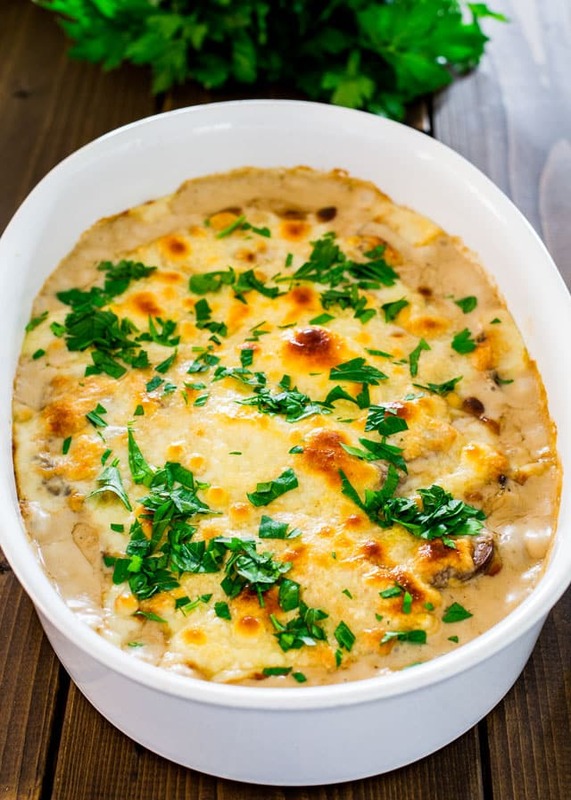 And because cheese makes everything better, just like bacon, I added some to this casserole, so now you have a cheesy, juicy chicken and mushroom casserole. Usually Muenster cheese is used in this casserole, but I couldn’t find it, so I used Swiss cheese, but the outcome is the same. I cut the chicken breasts horizontally in half then seasoned them with salt and pepper. Coat both sides of the chicken through a bit of flour then shake off any excess flour. Sear the chicken on both sides in a large skillet. Note that the chicken doesn’t have to be cooked through. Transfer the chicken to a 13×9 inch casserole dish. In the same skillet, melt the butter then saute the mushrooms. Stir in the sherry and cream of mushroom soup. Pour the mushroom sauce over the chicken then top with the cheese. Cover the baking dish with foil and bake for 30 minutes at 350 F degrees. Remove the foil and broil the casserole for a couple minutes, to brown the cheese a bit. You’re done! Here’s some changes and substitutes you can use in this chicken casserole. Mushrooms and cream of mushroom soup: a lot of people don’t like mushrooms, so if that’s you, that’s fine. Use a cream of chicken soup and another veggie you like such as broccoli or asparagus. It won’t be exactly the same but it will still be delicious! Sherry wine: Sherry is a fortified wine where the primary grape is Palomino; while the wine is fermenting, a layer of yeast called flor is allowed to form on top of the wine, protecting it from spoilage and oxidation. It’s a great wine and adds great flavor to the casserole. However, you can use any other type of white wine, whatever you happen to have in your fridge is fine. If you’re looking for a non-alcoholic version, just add a bit of chicken broth and you’re good to go. Swiss cheese: Actually this chicken is usually made with Muenster cheese but I didn’t happen to find it when I made this dish. If you don’t have either, feel free to use mozzarella cheese, or an asiago cheese would go really great here. Other cheeses that could work are provolone or even a white cheddar. Store leftovers in an airtight container for up to 3 days in the fridge. Yes, you can absolutely freeze this chicken casserole. Let it come to room temperature then wrap it and cover the casserole dish with aluminum foil tightly, and freeze up to 3 months. Thaw out overnight in the refrigerator then reheat it in a 350 F degrees preheated oven for about 30 to 40 minutes. Preheat oven: Preheat the oven to 350 F degrees. Season chicken and coat in flour: Season both sides of the chicken with salt and pepper. Add the flour to a shallow dish. Coat both sides of the chicken with flour; shake off excess flour. Sear chicken: In a large skillet, heat the oil over medium heat. Brown chicken on both sides. Note that the chicken doesn't have to be cooked thoroughly because it will finish cooking in the oven. Transfer chicken to a 13x9 inch baking dish. Saute mushrooms: Add the butter to the same skillet and melt over medium high heat. Add mushrooms and season a bit with salt and pepper. 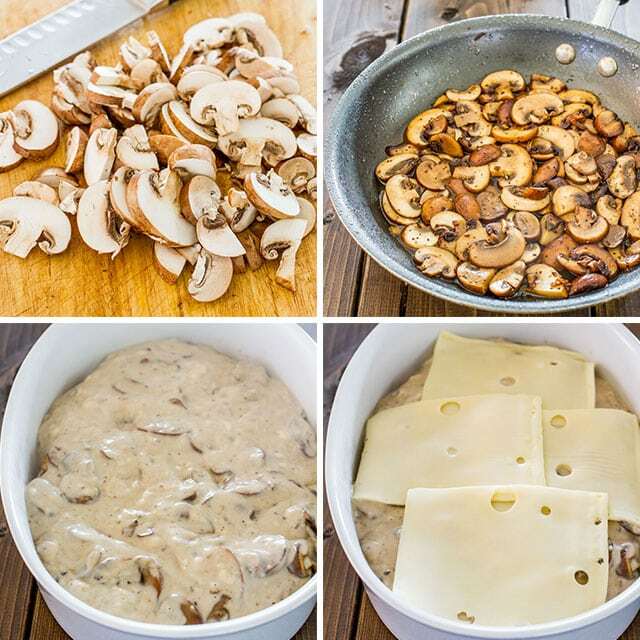 Cook mushrooms until golden brown. Stir in sherry and cook for an additional 2 minutes. Stir in soup and cook until thoroughly heated. 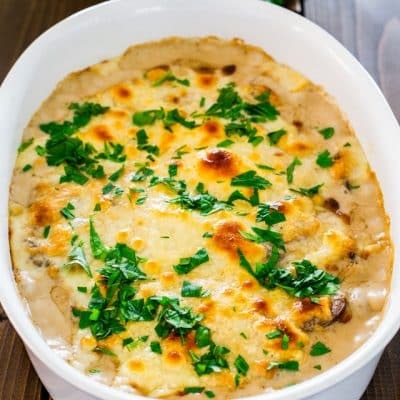 Assemble casserole: Pour the mushroom sauce over the chicken and top with cheese so that the entire casserole is topped with cheese. Bake: Cover dish with foil and bake for 30 minutes. After 30 minutes, turn oven to broil and remove foil from dish; broil for a couple minutes to brown the cheese, making sure you don't burn it. 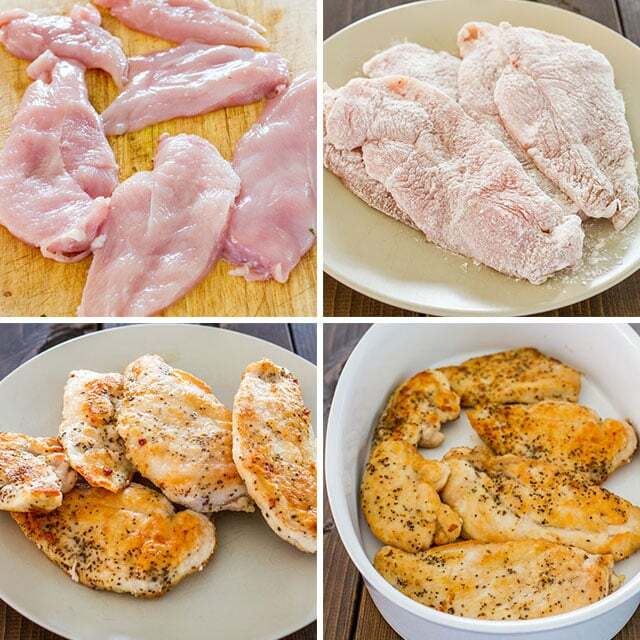 Boneless skinless chicken thighs can be used as well instead of the chicken breast. Recipe originally published October 2014. This should be called “Chicken Glorious” WOW IT WAS SO DELISH!! I used Munster cheese & chicken tenders because that is what I had!! Thank you again for another awesome recipe!! So so happy you liked this dish! I made this dish for a lady’s luncheon and everyone raved. I used cream sherry which made it so yummy. I also used Munster cheese, but have tried mozzarella too and that works well also. Thanks for sharing this recipe. 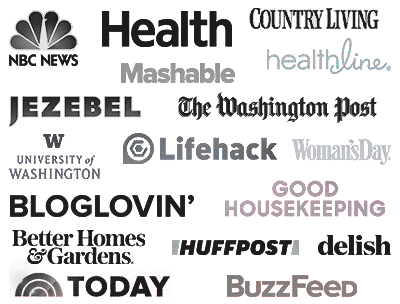 I look forward to trying more of your delicious recipes. I’ve made this several times and it rapidly became a fave of mine – so so so good!